Hairz Online: European Silky Straight 16"
Hairz Online - Human Extension - Silky Straight 16"
European Straight Weaving Hair 16". .
European Straight Weaving Hair 16". Light colors. * Light colors are easily damaged during double processing. 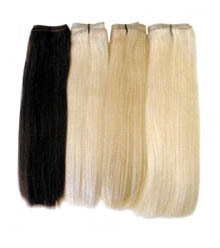 Special cares are needed to make consistent grade light color hair. Click here to view color charts for Sensationnel�.